These cookbooks include recipes from chefs, farmers, and farmers market community members from all over Atlanta and Georgia. The recipes ranged from complex, ingredient-heavy recipes by professional chefs and simple recipes handed down through the generations. 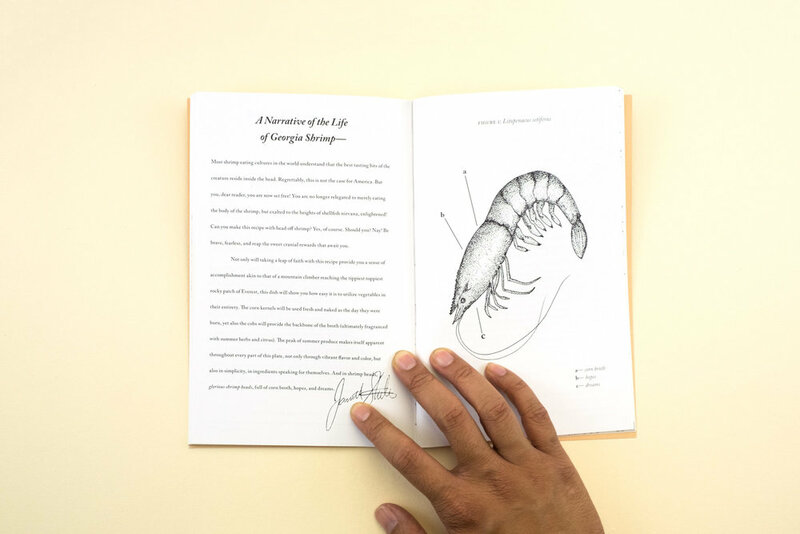 The inspiration for the design was taken from old community cookbooks that were popular in the South, often made created by churches and small community organizations. These cookbooks were often very simple and featured no photos, and they were largely contributed by every day people with every day recipes. 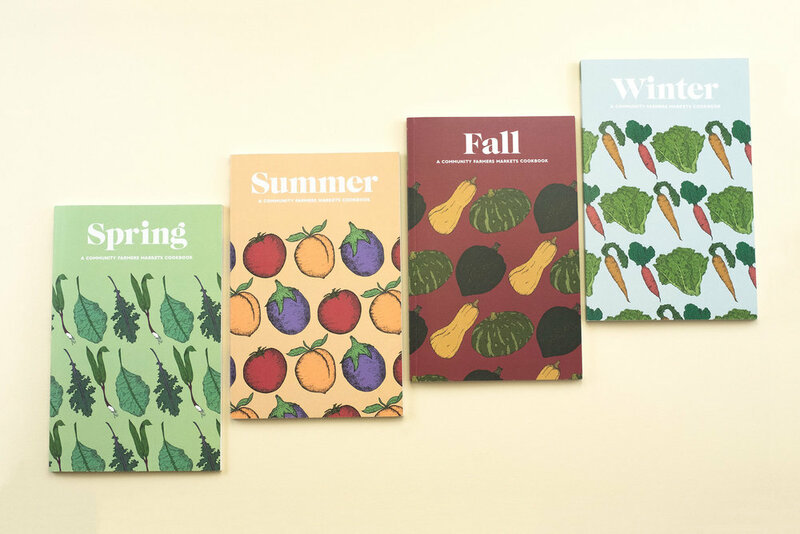 These cookbooks spanned 4 volumes (almost one hundred pages each) split into seasons, as the recipes were based on seasonal ingredients available at the local farmers markets. I created custom illustrations for many recipes, as well as customized typography based on the tone of the narrative submitted. 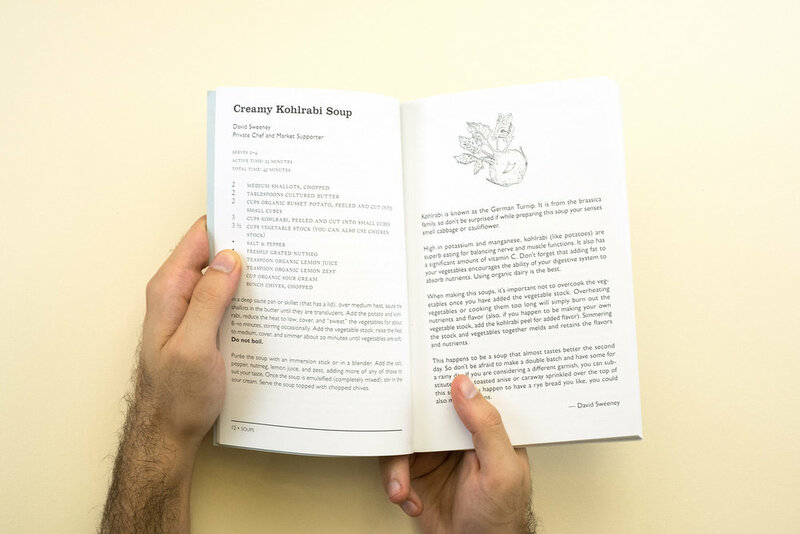 In the end, we had over a hundred recipes and narratives submitted by our local food community, and the books have since raised almost $10,000 for Community Farmers Markets. We focused on storytelling with these recipes—contributors submitted personal narratives alongside their recipes, and they would be published with the recipes. After all, food just tastes better when you're eating it with people you know, right? You can even enjoy a recipe I submitted for Vietnamese quick pickles at the bottom of the page! 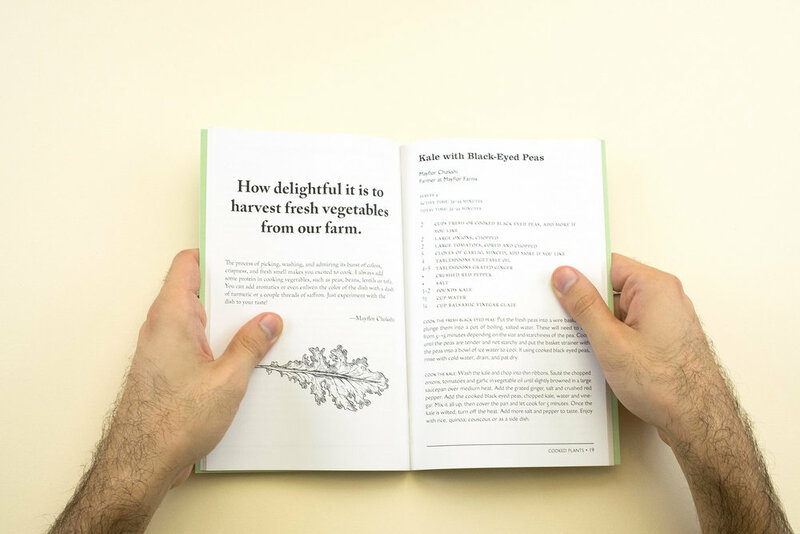 Cookbook concept and editing by the fantastic Alex Lampert. "My mom is allergic to every known organism in the animal kingdom (so she says), so we couldn’t have any pets when I was younger. But I used to bring a lot of animals home anyways. I’d spend my days outside in the woods, down by the creek, or around the neighborhood exploring and looking for creatures to call my own. Of course, she really didn’t appreciate coming home to find a napping kid and a stray cat in the house. Once, I caught a large turtle at the pond, brought it home, and stuck it in the tub. She was not happy. Another time, I had caught a bird (when you find a long-handled fishing net in the dumpster, you find a bird to catch) and released it in our tiny mobile home. She was definitely not happy. She never did find out about the snakes, though. Don’t tell her. Growing up, there were always two things I could count on: legendary Vietnamese mom-rage when strange animals showed up, and a jar of daikon and carrot pickles in the fridge. These pickles are called do chua (literally translated: “sour stuff”), and my mom would often spend a good portion of a weekend day making a large amount of these pickles. In Vietnamese cuisine, it’s all about combining contrasts: sweet and sour, delicate and rough, crunchy and watery, all traits that these pickles embody. You can find these pickles with almost every meal, and you might be most familiar with them on Vietnamese sandwiches: banh mi. But, try it with rice and pork, in lettuce wraps or summer rolls, or plain as a midnight snack. They’re refrigerator pickles, so no need to boil jars or anything. And definitely no need to tell mom about the snakes." Chop the carrots and daikons into matchsticks about 1 ½ inch to 2 inches long. In a bowl, toss the chopped carrots and daikons with the salt, and let sit for about 30 minutes, tossing them occasionally. Combine the vinegar, water, and sugar in a pitcher with a spout. Stir to dissolve the sugar. Check on the carrots and daikons: you want the daikons soft enough that they can bend easily without snapping. Then drain the liquid from the bowl, pressing down gently to release any more liquid from the roots. Give them a very quick rinse under cold water if you want the pickles to be less salty. Put the chopped carrots and daikons in a jar large enough to contain them, and cover them with the brine. Let sit for at least one hour if you plan to eat it right away, but the flavor is best if left at least overnight in the refrigerator. They will last about four weeks until they get soggy and unpalatable. Change the recipe to your liking—every Vietnamese person has a different recipe. Try it with the addition of shallots, more vinegar, less salt, higher ratio of carrots to daikon, etc.